Welcome back. Tell me. Be honest. Don’t you miss my insect posts? Not just the important ones like Entomophagy (consuming bugs) and Plastic-Eating Insects. I mean the fun ones like Millipede Photo Addendum (Giant African millipedes!) or Cyborg Insects or even Beetle News (dung beetles). I know it’s hard to choose from the 26 insect posts. 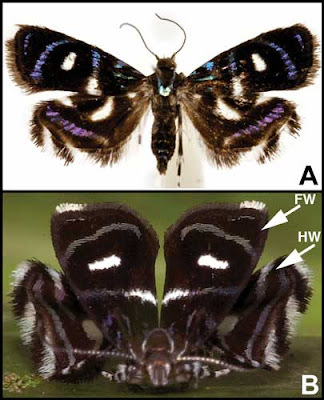 Anyway, do you remember my post on butterfly and moth eyespots (Eyespots Photo Addendum)? 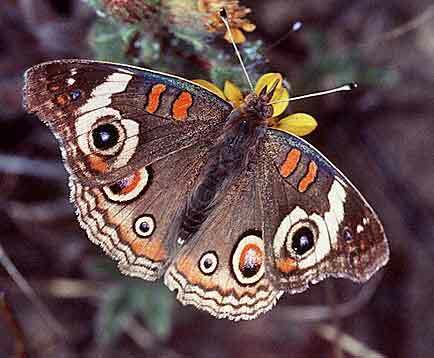 Those eye-like markings on wings are likely a form of mimicry to deceive predators. Well, I’m back with bugs, because I’ve got an absolutely phenomenal example of mimicry. I missed a study on this one in 2006; I wasn’t blogging yet. But there was no way I could let the recent study slip by without fanfare. Biological mimicry is found throughout the animal kingdom and can take different forms to appear dangerous or inedible or to draw a predator's attention away from vulnerable body parts (for the latter, see my post Fish Eyespots). Not often, however, does a species mimic its own predator, especially in both appearance and actions. That’s what University of Connecticut researchers found when they studied how the metalmark moth (Brenthia coronigera) evades the jumping spider (Salticidae family). Jumping spiders have acute vision, distinguishing prey, mates, rivals and enemies by shape, symmetry, presence of legs and wings, size and style of motion. They maintain their territory from other jumping spiders through ritualized displays, such as a male raising and waving his forelegs at the intruder. The researchers observed that the metalmark moths perch on vegetation in a peculiar posture, raised forewings and twisted hindwings, so they look like the spider from front and back. To top it off, the moths move with short, rapid, jerky motions, in a manner similar to the spider. Through various trials pairing one jumping spider with one moth in a small container, the researchers found the metalmarks had much higher rates of survival than a control moth species, which exhibits no mimicry. When the moths and spiders were of similar size, only 5 of 77 metalmarks were caught, compared to 43 of 69 control moths. Many jumping spiders engaged in territorial displays after encountering a metalmark; there were no displays with control moths. In fact, the spiders began stalking the control moths soon after the moth was introduced in the container. OK, that’s interesting, you say, but phenomenal? Here’s the rest of the story. Researchers from Taiwan’s National Sun Yat-sen University, the University of Tokyo and Queen Mary University of London went a step further, exploring the relative importance of the visual and locomotor signals the metalmarks use to deceive jumping spiders. To determine whether the two forms of mimicry back up one another or serve different purposes, they tested the metalwork moth along with a moth species, which relies only on locomotor mimicry, and a control moth. Compared to the other moths, the metalmarks’ use of pattern, posture and jumping behavior allowed more time to escape and resulted in the lowest predation rates. The researchers also tested metalmarks, whose eyespots were removed with watercolor brushes, and metalmarks, which were frozen in a territorial display or neutral posture. 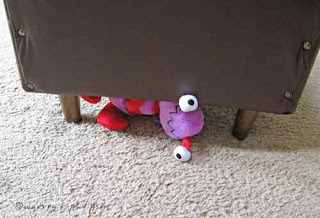 The predation rate increased when the eyespots were removed, and the spiders attacked significantly sooner when the moths were in fixed positions. The study results clearly supported the back-up signal hypothesis--multiple forms of mimicry deceive predators better. And here’s what you’ve been waiting for. As in the earlier study, some spiders performed leg-raising displays with the metalmarks. At least some of those displays were attributed to courtships. The metalmarks did such a super job at mimicking their jumping spider predator, the spiders were actually courting them.